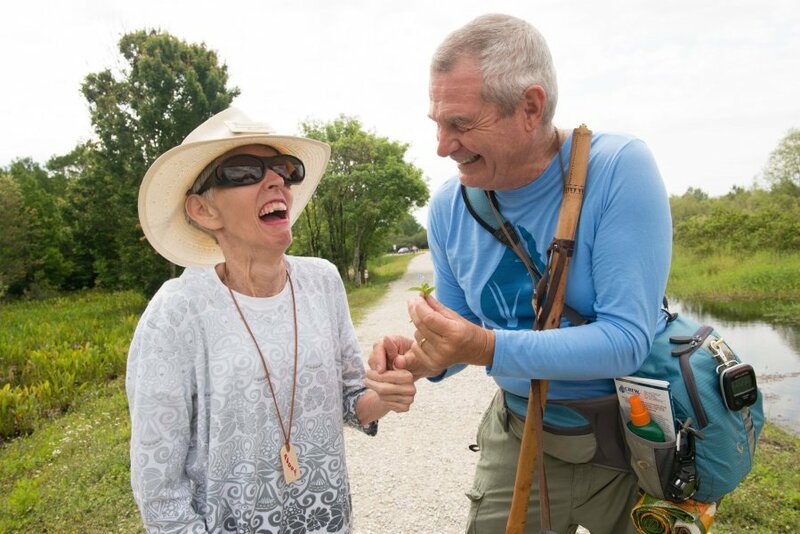 Nature’s Peace at CREW is an award-winning series of programs for early-stage Alzheimer’s patients or persons who are visually impaired and their caregivers at the CREW Bird Rookery Swamp trail. The Nature’s Peace program consists of a picturesque guided stroll over a boardwalk that overlooks a magnificent swamp habitat and frequently produces memorable encounters with butterflies, birds, reptiles, amphibians and mammals. CREW Trust staff and volunteers stimulate the participant’s senses of touch, smell, and hearing by locating and identifying the many forms of Nature that live around every corner. The accompanying caretakers get a brief respite from their daily duties of patient care while enjoying their loved one’s interaction with nature. The Nature’s Peace stroll is held each month, November through April. The stroll is relatively short. Participants must be physically capable of standing and walking about 0.7 of a mile over a period of 90 minutes. The program is free thanks to the contributions of the CREW Trust members. For Alzheimer’s patients and their caregivers, register through the Alzheimer’s Support Network (239) 262-8388. For visually impaired persons and their caregivers, register through Lighthouse of Collier (239) 430-3934. Nature’s Peace at CREW received the 2013 Paradise Coast/Collier County Tourism Star Award for “Best Innovative Idea”.